For my card, I embossed the patterned paper then went over it with the ink pad to highlight the embossing. Then I fussy cut around part of the fox's head on the image. Using the distressing tool I went around the edges of the image, then used the ink pad around it. I added mounting tape on the back of the image, doubled behind the fox's head to have him up farther and added it to the card. Then I glued the mushrooms on. I hope you like my DT card and it gives you some inspiration. Thank you for stopping by. Hope to see you join us. 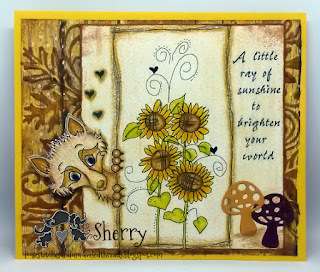 More sunflowers - love it. Also that fox is just adorable. Great design.